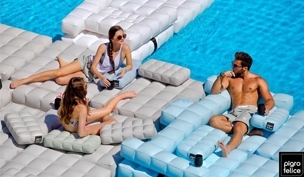 High-end modular inflatable furniture for your patio or pool, ideal for both indoor and outdoor use. Pigro Felice. Unlike other PVC products on the market, Pigro Felice Phatalate FREE PVC is rated safe for your Kids, your Skin and is non-carcinogenic! Pigro Felice PVC is safer for human usage unlike less expensive materials. The distinctive character of Pigro Felice PVC makes it slip-resistant while the smooth texture feels like fabric against your skin. It contains no azo dye so there is no plastic odor. Extra thick Pigro Felice PVC is durable with enhanced thickness that makes it resistant to tears, rips and other damage. In addition, the material does not fade from exposure to chlorine or the sun’s ultraviolet (UV) rays. Pigro Felice PVC was created following extensive research and development to ensure your safety. It is rated 3PHR on the Flame Retardant Safety Standard and EN 71 on the European Safety Standard.